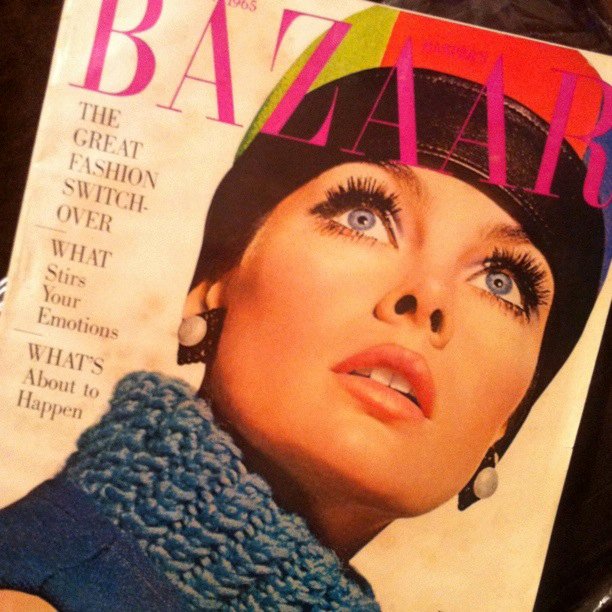 A few glances at Harper's Bazaar, November 1965- an incredibly exciting and thoughtful birthday gift from one Ms Doree Shafrir. Even with these 3 small peeks, you can see how aaamazingly INSPIRATIONAL this is going to be. The blue scarf ont eh cover is very Prada chunky knit, and how au courant is the zip up lace bustier? In 1965 this was obviously ONLY an undergarment but STILL. The back page ad is a real show-stopper; "He's a holiday hipster at home in bell-bottomed velvet!" Hipster?!?! BELL-BOTTOMED VELVET?!?! A MATCHING RED AND YELLOW HAT FOR YOUR RED AND YELLOW ENSEMBLE? Stop yourself, 1965. YOU ARE TOO GOOD. That Short bobbed hair with fringes, looks a killer from the second photo! WHY do they all look stylish back then! sheeesh. lucky girl! 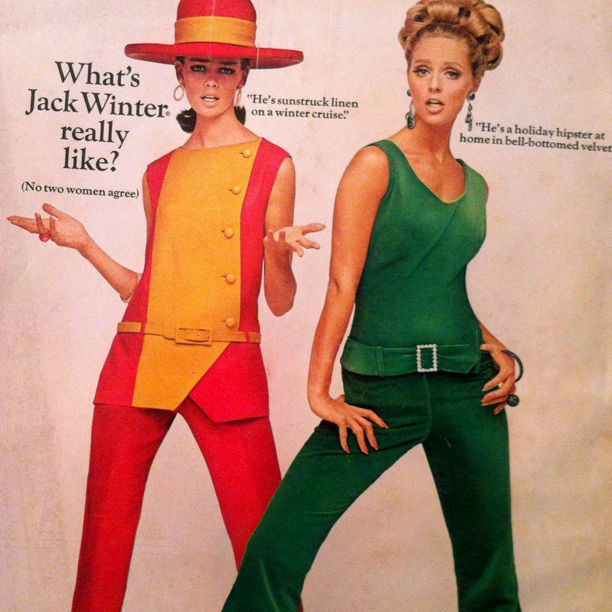 I love vintage fashion magazines and don't really own anything that stands out quite like this. I am crazy about the cover girl's lashes. I wonder what the term "hipster" mean in 1965? I love vintage images.. and owning a really old magazine is just too cool.. those photos are great.. I'm deeply into velvet right now.. the 60s and 70s are the best decades ever! Ahhh ! So fun. I want to dance around in my room in the white corset! I love pretty little under-pieces. And isn't that '70s style icon Ali McGraw in the red/yellow outfit? Make beyond any doubt the loan specialist if authorized. This may appear glaringly evident yet there are a lot of organizations out there loaning without a permit.